Neapolitan pizzas emerge from a wood-burning oven at this Upper Kirby eatery. Lunch Tues.-Sun., Dinner nightly, Brunch Sun. : This cozy spot in the former home of Sorrel Urban Bistro fills a much-needed niche in the neighborhood. 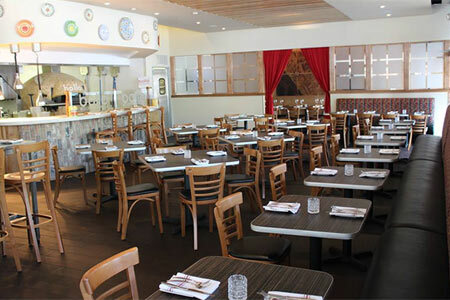 Tables are scattered around the large dining room, which includes a few booths and banquette seating. Owner Ray Salti sources real buffalo mozzarella and 00 flour from Italy, and the handmade oven has been approved by the VPN (Verace Pizza Napoletana) Americas association. Of course, there's a margherita pie on the menu; however, the true standouts are the Biancos, like the "Bianco de Bollo" with a base of EV olive oil, basil, tomatoes and mozzarella. The "Texas Wagyu Beef" pizza features locally sourced meat from Simonton, Texas. Available as well are salads, small plates and a few entrées (double-cut pork chop Marsala, a juicy lamb shank). Start with a loaf of garlic Parmesan bread (made from the pizza dough) with a marinara dipping sauce before moving on to Gulf shrimp sautéed in garlic and olive oil and the lobster ravioli in creamy truffle butter. Bollo offers gluten-free pizza, kid-friendly selections, cocktails and a limited wine list.